and have the latest bios AMI 7.16 installed, and it doesnt seem to support 3rd gen lga 1155 processors as people say. so i heard about this website and that it can add cpu support if i provided the bios. other h61 motherboards support it after a bios update. Your motherboard has three revision. So I still need good foto of your one. 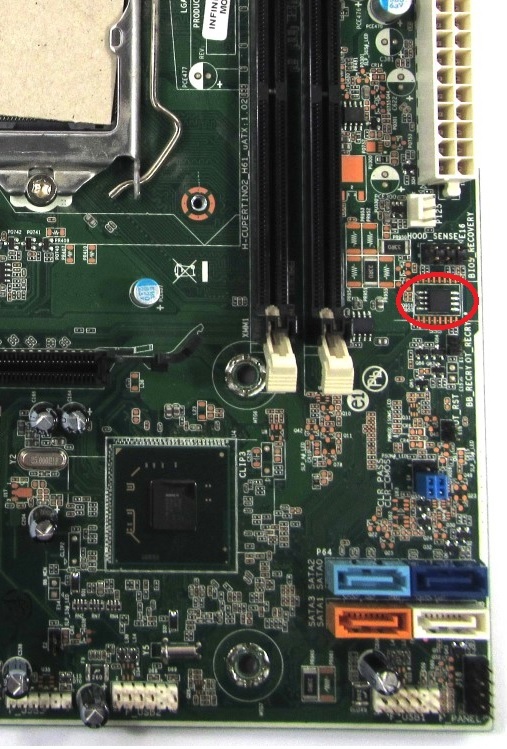 but typing the command :"wmic baseboard get product,Manufacturer,version,serialnumber"
Or just writedown info upper PCI-E slot. It has only two cores. never mind, i checked near the ram slots saw " AOF-F MOS" is that it? Bad news! Your motherboard is H-Cupertino2-H61-uATX:1.02 with 4 Mbytes BIOS chip. I think you have H-Cupertino-H61-uATX:3.10 with 8 Mbytes BIOS chip. Your motherboard can't boot CPUs with Ivy Bridge core. I can add microcodes for Ivy Bridge but I think it doesn't help. You can buy i5-2300 with 4 real cores. it has the same price as i3-3250, but little faster. And info from H61 chip too. May be you are lucky and your chip has useful revision. Or just post a screenshot of Mainboard tab of CPU-Z. woof,wait is the 4mb version the good one or what? but still il check tomorrow when i get home! i am doing a bet here you know, i am really depending on your experience here,because wonce you added compatibility i would get that i3 lol. If you have useful revision of H61 and 8 Mbytes BIOS chip then you can try flash BIOS from HP pro 3500. It supports Ivy Bridge. How much money you can spend for upgrade? il get the bios size thingy later when i have time, dude what you are doing here is going to save a lot of folks out there XD, just the last day i helped a guy boot with his his gpu, he had the same problem as me on the same pc model but i got it to work so i told him how, now id like to tell another one that he will be able to get a rd gen cpu ! i just hope it doesnt brick my mobo,will it? Revision B3 of H61 supports Ivy Bridge. But BIOS of HP Pro 3500 have size 8 Mbytes. So I need to know a real size of your BIOS chip.